The Romney campaign today denied any connection to anonymous aides who to spoke to a British paper about his appreciation for "Anglo-Saxon heritage," but the White House said that Romney was "fumbling" his foreign policy trip. In one of the most heated exchanges between the two campaigns, several spokespeople and surrogates entered the fray to assail, qualify and deny the comments. Coinciding with Mitt Romney's arrival in London for a six day foreign trip, The Telegraph reported two Romney advisers, later characterized as members of "the foreign policy advisory team," said President Obama could not fully understand the "Anglo-Saxon heritage" between the U.S. and Britain. "We are part of an Anglo-Saxon heritage, and he [Romney] feels that the special relationship is special," a second Romney adviser told the newspaper. "The White House didn't fully appreciate the shared history we have." Those remarks prompted Telegraph reporter John Swaine to note they could be read as racially insensitive, given the president's mixed African and European heritage. "Obama is a left-winger. He doesn't value the NATO alliance as much. He's very comfortable with American decline and the traditional alliances don't mean as much to him. He wouldn't like singing [British hymn] 'Land of Hope and Glory,'" another adviser told the paper. The Obama campaign swiftly responded. In a tweet, Obama adviser David Axelrod called the anonymous attacks "stunningly offensive." Both Vice President Biden and Obama spokeswoman Jen Psaki lampooned the comments. "Despite his promises that politics stops at the water's edge, Gov. Romney's wheels hadn't even touched down in London before his advisers were reportedly playing politics with international diplomacy," Biden said. 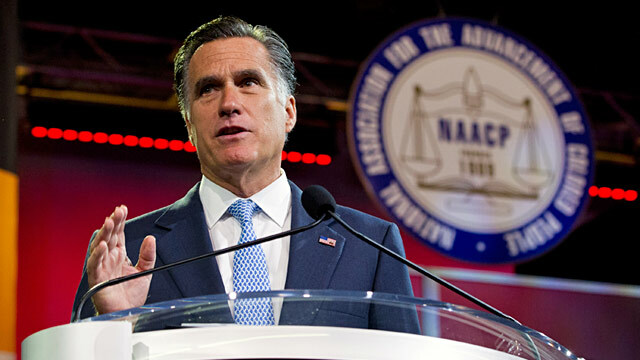 Romney had previously said he would not attack the president while outside of the country. "One of his advisers violated exactly what they said they wouldn't do which is criticize the president beyond the borders of the U.S.," Psaki said aboard Air Force One. "This is a case where there is a continuous fumbling of the foreign policy football here, and it does raise a question as to whether Mitt Romney and his team are ready to have serious conversation about a foreign policy," Psaki said. The Romney campaign denied the authenticity of the article. "It's not true," Romney campaign spokeswoman Amanda Henneberg said in a statement to ABC News. "If anyone said that, they weren't reflecting the views of Gov. Romney or anyone inside the campaign." Another Romney spokesman Ryan Williams said the report was based on "false quotes." Swaine responded on Twitter, standing by his story. While there is a long tradition of not attacking the president when overseas, there's an almost equally long tradition of violating that dictum. "That is the old rule, but it's often ignored and there's a long history of partisans attacking presidents while they or the president is abroad," said Larry Sabato, director of the University of Virginia's Center for Politics. Sabato said there is always a difficulty in holding a candidate responsible for his surrogate's comments, especially when it's unknown just how high up in the campaign these advisers were. Nevertheless, he called the remarks "unwise comments that even the Telegraph acknowledged bordered on racialist." "Basically, their argument is Romney would just identify more with Cameron because he's white. That's really what they were saying," Sabato said. Other Romney campaign surrogates have, however, on the record suggested Obama, who spent part of his childhood in Asia, did not know what it meant to be an American. Romney campaign co-chair John Sununu last week on a call with reporters said Obama "has no idea how the American system functions, and we shouldn't be surprised about that, because he spent his early years in Hawaii smoking something, spent the next set of years in Indonesia." "I wish this president would learn how to be an American," Sununu said.